The Good News: Today I’m sharing a Subway Art freebie. The Bad News: It’s a peace-offering since I’m not going to reopen the SFD Digital Store this year. You see… My life is full… full of good things, but I’m having to adjust and prioritize. My fun side-business has to be put on the back burner for a long while. I was asked to be the President of the Relief Society in our local church congregation a few weeks ago, which makes my life a wee bit more full. This quote, “We Can Do Hard Things” is my new mantra. I love it! It reminds me that I can make it through hard things with my spouse, my family, my friends, and most importantly… my Heavenly Father. I know I am strengthened by Him daily. Everyone has hard things… everyone. We need each other. I even remind my 3-year-old that HE CAN DO HARD THINGS… like pulling up his pants or cleaning up his room or eating 3 bites of that nasty dinner. This quote applies to all. p.s. I do have to apologize that all the images I shared are pretty random. There is no consistent color scheme in all the sizes and on some images there is a scripture from Alma 26:12… and others, a scripture from Mark 10:27. What can I say… I’m a spaz sometimes? Hopefully you’ll find one to enjoy… and another to share with a friend. p.p.s. 16×20 prints well in an 8×10 size… so don’t let that frighten you – the dimensions are the same. Also… for your convenience the 3×4 cards are designed to print two-up on a 4×6 print. Thanks Heather. Glad I printed off the quiet books when I did. 🙂 But I understand. WE CAN DO HARD THINGS!! Heather this is perfect! I just got called to be the YW President in my ward last week and I took this to our first presidency meeting. I’m with you…my life seems to be a wee bit more full these days. Good luck! Thanks again for sharing. It’s just what I needed. Did you happen to grow up in Sugar City? I just noticed your post about your family, and I think I recognize you! I adore your blog & creative mind! I would love to help on the quiet books so you could offer the download. Contact me @ chrisemclark@hotmail.com. Best wishes on the new calling- the ladies in your ward are lucky to have you! Hi Heather, A friend showed me your website last year right after Christmas. I love it and I wish you the best of luck with your newest addition to the family. I know you are busy, but I need to ask a favor. I have been waiting all year to print and use your Pres.Faust ‘I believe in Santa’ quote and today I tried to at Inkleys. They refused to let me print it and told me I need to contact you for a permission to print form. Could you please send that to me when you get the chance? I would appreciate it greatly! Thank you in advance!!!!! What is the President Faust quote I believe in Santa? Question for you. 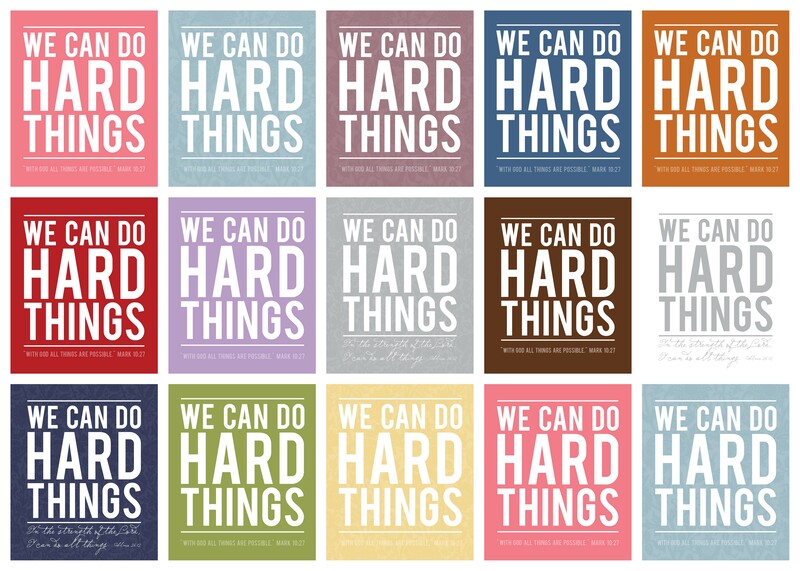 I know that you put the scripture reference on purpose on the “We Can Do Hard Things” poster, and I really appreciate that- love the Mark verse!- but I teach in a gifted and talented classroom in public school. I would love to use the quote, but I can’t have the scripture reference. Do you have a version without the scripture reference? Thanks in advance if you do! Your entry strengthened me in my present trials. May the Lord bless you and your family. Thank you so much! Just printed the navy one for our dining room. I have three daughters (9, 7, 2) and we are needing a little reminder that indeed we CAN do hard things! Off to get a frame and get this gem up! Our newest addition A Happy Surprise!